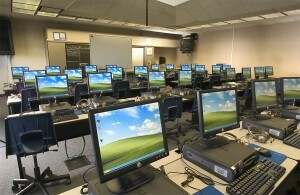 When I did my student teaching for my MAT in an Oregon high school in 2007 the Geography class I taught was in a computer lab. There weren’t any other classrooms available and I had the lowest seniority. It turned out to blessing in disguise, as the textbook was so old it still included the USSR and East Germany. I set up lessons on Moodle, which the students worked through while I moved around the classroom checking on and conversing with them. Many of the technical problems I encountered were annoying, but I also appreciated the freedom it gave me leave the lecture podium and increase my one-on-one interaction time. I’d love to hear more about how things progress for you, Ben! It may seem like a disaster in certain regards, but these lessons teach you so much and make your next lessons THAT much better. You’re essentially teaching two languages; 1. English, obviously and 2. Computers. These can be two daunting tasks for anyone! I’m sure that the next lesson will be better.